Chile and jalapeño peppers are pungent members of the same botanical genus, Capsicum, to which bell peppers belong. Chile is eaten green or red. Green chile, the immature fruit, is classified according to pungency, which varies from mild to very hot. Green chile may also be classified as long or short; jalapeño chile is a short green chile known for its extreme pungency. Green chiles are also prized for their savoriness and fleshiness. 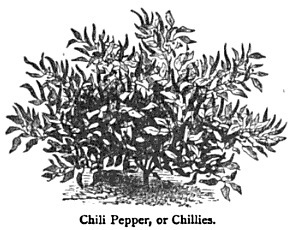 Red chile is the mature fruit of the pepper plant. Most red chile is processed for use in food coloring. Because of its pungency and flavor, it may also be processed for use in sauces, blends, and seasonings. The cayenne and tabasco peppers, used in sauces for flavoring, are extremely hot peppers used only in minute portions at any one time. These peppers are not produced commercially in New Mexico, although they have been introduced experimentally. Garcia reported in 1908 that green chile was being canned in Las Cruces, New Mexico and Los Angeles, California. In 1919, Valencia, Sandoval, Socorro, and Dona Ana counties were producing the largest acreages of chile in New Mexico. The average market price for fresh green chile was $20 per ton. Appearance of fusarium wilt increased the risk associated with chile production. 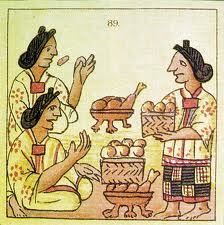 In the 1930s, Indians on the Laguna Reservation produced vegetables for their own use, chile being the principal crop. 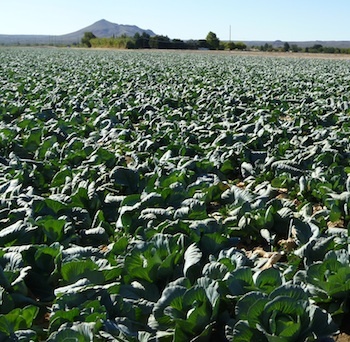 The shortage of irrigation water limited that vegetable production. Until 1944, the state’s chile marketing was highly informal, and product quality apparently was not related to price. Growers in northern New Mexico had begun selling ground red chile to market outlets in Colorado, Arizona, and Texas. In southern New Mexico, sizable quantities of red chile were produced and sold to processors, brokers, and buyers, with a few growers contracting to California canneries. 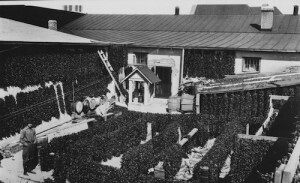 Barker’s Enterprises, Las Cruces, produced sizable quantities of chile transplants until the death of the producer in the 1950s. The New Mexico Fruit and Vegetable Standardization Service in the early 1940s proposed preliminary standards for sun-dried red chile with the following grades: New Mexico Fancy, New Mexico No. 1, New Mexico No. 2, and New Mexico Sample Grade. These were never adopted at the federal level, and to date standards for grades of unprocessed chile do not exist. A 1961 report on vegetable variety trials at the Northeastern Branch Station, in Tucumcari, mentioned green chile for commercial processing as a promising crop, although hail in late spring may be a production hazard. In New Mexico, approximately 10 commercial chile-processing enterprises now can or freeze red and green chile products or dehydrate red chile. Significant quantities of New Mexico chile are also processed in Texas and California. Red chile dehydrators were introduced into New Mexico in the early l960s and they largely replaced the sun-drying process. National chile production data are not available from the USDA Statistical Reporting Service since national acreage is relatively small. However, chile acreage estimates for New Mexico are avail- able since 1970. These estimates do not distinguish among types of chile, but they are a beginning in providing an improved industry data base. Additional data on chile production and price may very well serve as an incentive to further industry development. New Mexico chile acreage has continually increased from 1970 to 1973. Much of the crop is produced along the Rio Grande Valley, with Doña Ana County having the largest acreage. Prices for red chile in 1972 ranged from $0.60 to $1.00 per pound in northern New Mexico roadside stands and local markets. Processing plants paid $0.30 to $0.35 per pound for red chile. Green chile ranged from $0.10 to $0.25 per pound in roadside stands and local markets throughout the state. 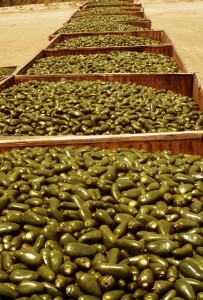 Processing plants paid from $0.03 to $0.04 per pound for green chile. Processors’ prices varied with negotiation of delivery or pickup. 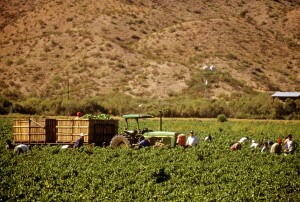 The majority of commercial chile farmers operated under contract because of lower price risk. All prices for chile in 1973 were slightly higher than 1972, due to an increased demand and lower yields. Most chile is hand-harvested with mechanical aids such as conveyor belts moving the produce into bulk bins. Mechanization of red chile harvesting equipment is in the trial stage: less than 0.1 percent is harvested in this manner. The New Mexico State University Agricultural Experiment Station is evaluating machine components for selective harvest of red and green chile. Private concerns in the state are also working to mechanize chile harvesting. From: A History of Vegetable Crops in New Mexico, New Mexico State University Experiment Station Bulletin 624, 1974. Courtesy Rio Grande Historical Collection, NMSU Library.